Length: 2 hrs. 7 min. The remarkable audio edition of C.S. 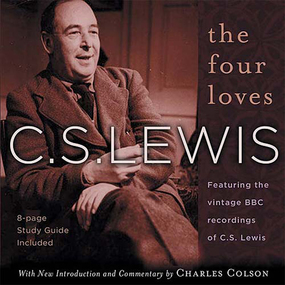 Lewis' beloved classic is the only existing recording of Lewis reading his own work. With penetrating logic and winsome wit, he explores the four aspects of love: storge (affection), philia (friendship), eros (sexual love) and agape (selfless love). Lewis exposes the pitfalls in our loves, leading us to the agape love that God has for men and women and the kind we must develop to nurture our relationships.